[http://www.jriver.com/ JRiver Media Center] is one of the most advanced media players available. In addition MC also provides '''Media Network''', a rich set of tools and features for moving your media around the network. Any media, any time, any place. * Support for External Interfaces (see these links for more details on how to configure and use MC's [[Library Server]], [[DLNA]], [[Web Service Interface]]). These interfaces allow external devices to interact with Media Center as a Remote Control, Player, or Server. [http://wiki.jriver.com/index.php/Gizmo Gizmo] (shown below) is an Android app that can control your MC server wirelessly or stream music or pictures from it. Gizmo can also act as a remote control for JRiver Media Center, controlling MC's [http://wiki.jriver.com/index.php/Theater_View Theater View] from your phone. [[File:NUC2820.jpg]] The [http://jriver.com/Id/ JRiver Id] is an inexpensive, low power network device, available in several configurations. * [[Remotes]] provides a list of the current Remote devices. * [http://wiki.jriver.com/index.php/WebPlay WebPlay] '''streams media from your PC to a cell phone'''. Works now on Android, iPhone, Touch, and iPad. Coming soon on WinMo. [http://www.pix01.com/gallery/8D12431D-7EA0-495D-9EA2-775091458CB9/Gizmo_and_WebPlay/ Pictures] For Android, see also [http://wiki.jriver.com/index.php/Gizmo Gizmo]. * [[Library Server]] outlines how to connect multiple MC Instances together in one integrated whole. * [[DLNA]] support makes MC a perfect server for your new network capable TV or Blu-ray player. DLNA is a nice solution for serving media to a device, and it also provides the remote control. * [[ZoneLink]] offers the ability to play the same content in multiple locations, including local hardware zones, or Media Network devices. * [http://yabb.jriver.com/interact/index.php?topic=52261.0 Tremote] is '''another remote control''' feature that uses MC itself as the remote. * "Play to" another room with a DLNA device like the new [http://wiki.jriver.com/index.php/J._River_ID JRiver ID]. 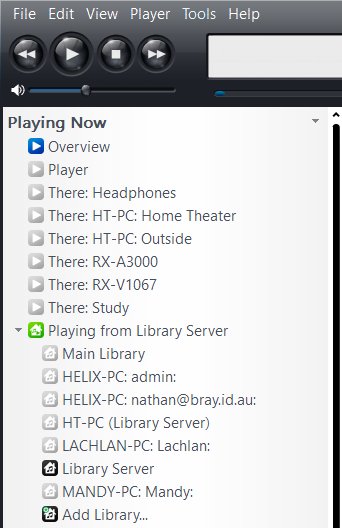 "Play to" uses MC's [http://wiki.jriver.com/index.php/DLNA DLNA] components to '''play your media on a TV or Blu-Ray player''' somewhere else on your network. It's a new feature of Windows 7, but our implementation also works on Vista and XP. See also [http://yabb.jriver.com/interact/index.php?topic=55379.0 DLNA TV's] and [http://yabb.jriver.com/interact/index.php?topic=55380.0 DLNA Boxes] on our forum. * '''Access your home Library Server from anywhere''' on the Internet. MC can generate an Access Key that you can mail to yourself or a friend. There's no need to know the IP address and port. Visit MC Options for Media Network to obtain the key and test its use. Test local use first since using the library from outside the LAN will require changing your router. See [http://wiki.jriver.com/index.php/Network_Access Network Access] here for more information. * [http://wiki.jriver.com/index.php/Library_Server Library Server] can also '''serve your media to other PC's''' in the house. * '''Sync your changes back''' to Library Server when you make them on a client. 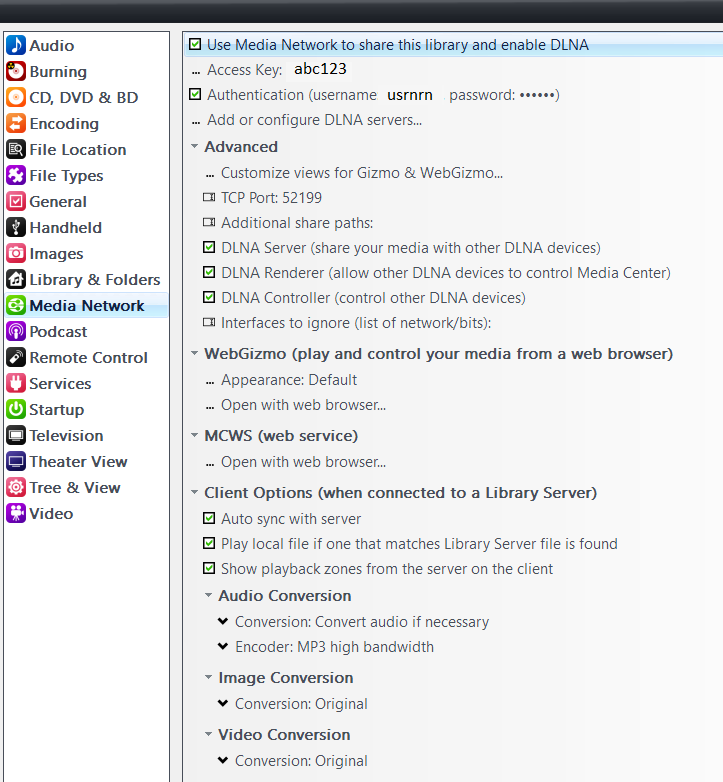 * [http://wiki.jriver.com/index.php/DLNA '''DLNA'''] support makes MC a perfect server for your new network capable TV or Blu-ray player. DLNA is a nice solution for serving media to a device, and it also provides the remote control. Run MC on a netbook or '''use your cell phone as a remote''' using [http://wiki.jriver.com/index.php/WebGizmo WebGizmo]. 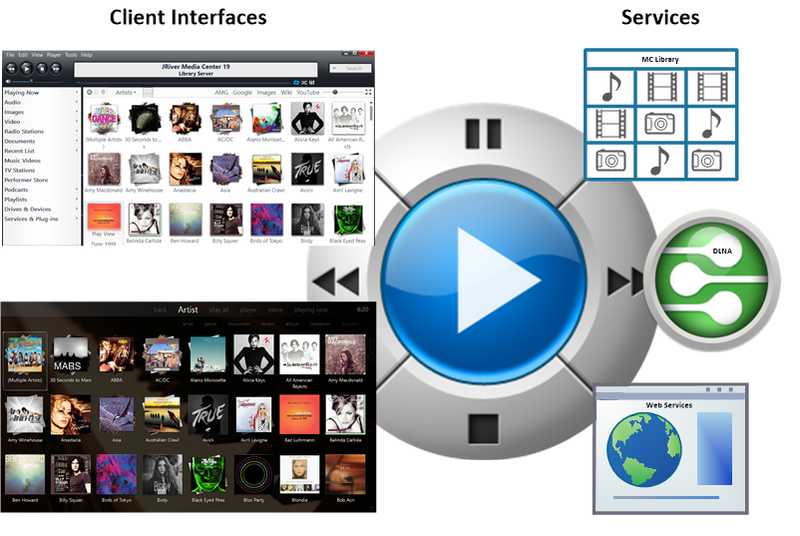 * [http://wiki.jriver.com/index.php/ZoneLink ZoneLink] offers the ability to play the same content in multiple locations, including local hardware zones, or DLNA devices. * [http://wiki.jriver.com/index.php/Media_Center_Remote Media Center Remote] makes '''remote control of your MC TV''' simple. * Developers may find the [http://wiki.jriver.com/index.php/Web_Service_Interface Web Service Interface]useful for writing applications that can control MC. * Developers may find the [[Web Service Interface]] useful for writing applications that can control MC. '''For more information''', or to ask a question, please visit the [http://yabb.jriver.com/interact/index.php?board=7.0 Media Network board] on Interact. [[Home Networking Examples]] contains some examples on how users are using MC and the Media Network Features. Here's how to [http://wiki.jriver.com/index.php/Upgrade_to_MC18 Upgrade to MC18]. It's $26.98.